Fluid Painting with Kids is an absolute joy! This messy painting idea is a clear win for adults and kids alike and with some supervision, can produce creative and hang worthy masterpieces! 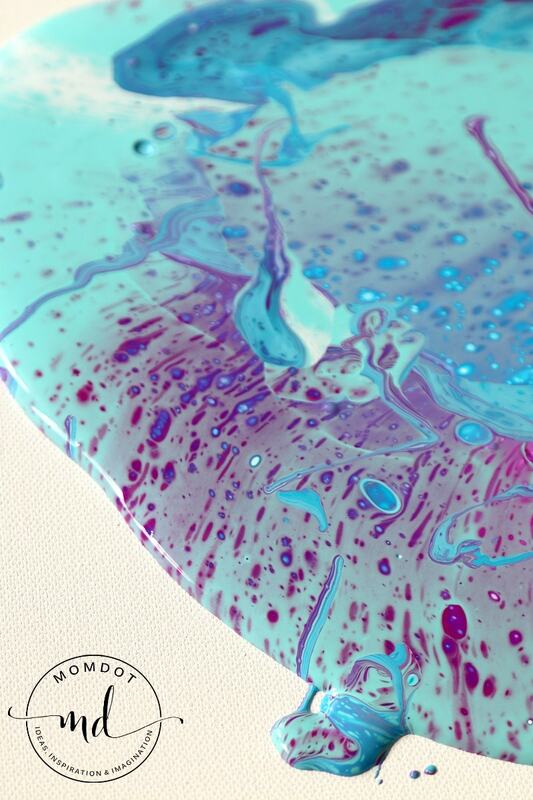 See below one of our parent/child fluid paintings and how we did it. 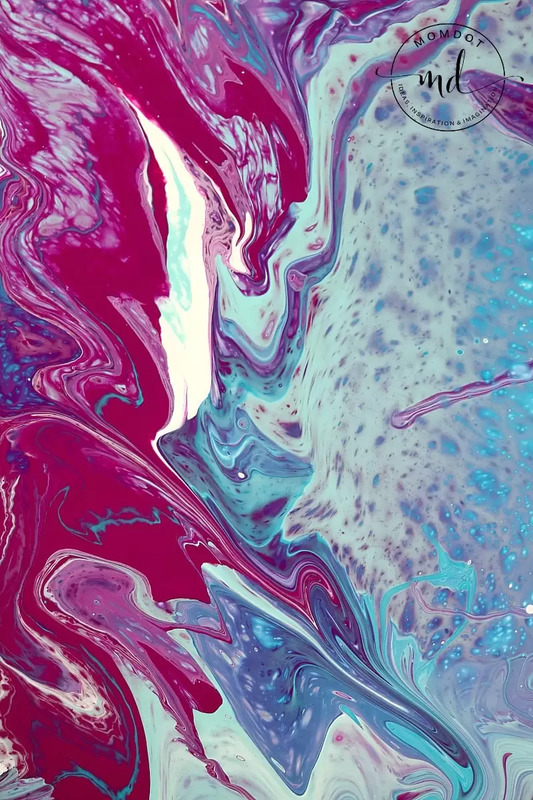 To see another tutorial that breaks down how to fluid paint, read this Fluid Painting Tutorial here. When it comes to fluid painting, preparation is key. This is a fun, but quite messy, craft. 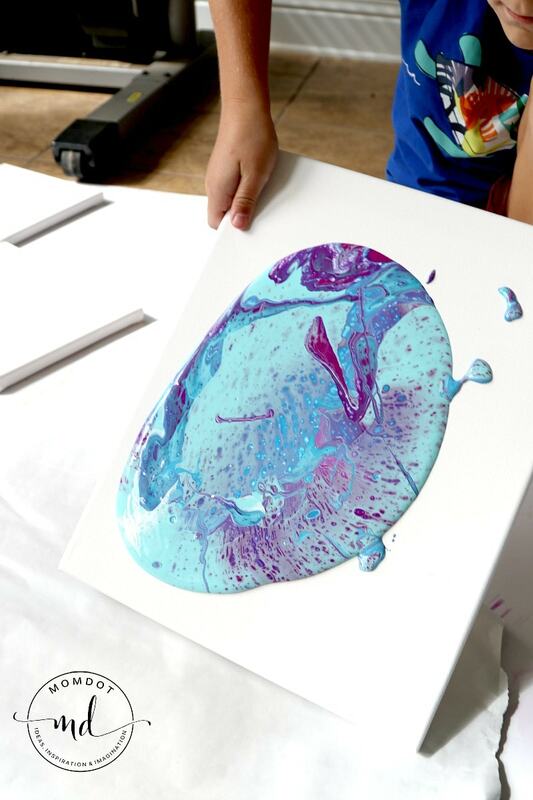 While I think most kinder ages and up can successful work with you to create a pour painting, make sure your child understands and follows instructions well. The painting below was poured by my 6 year old. Paint : Acrylic paints work well for this project. You will need a lot of paint, so grab 1-2 tubes per color per paint. Buying paint in LARGE bottles also works well for cost if you want to create more than one painting, but skip the little tiny bottles. You will need the whole entire thing if you do that. The first thing you need to do is make your paint mixture. 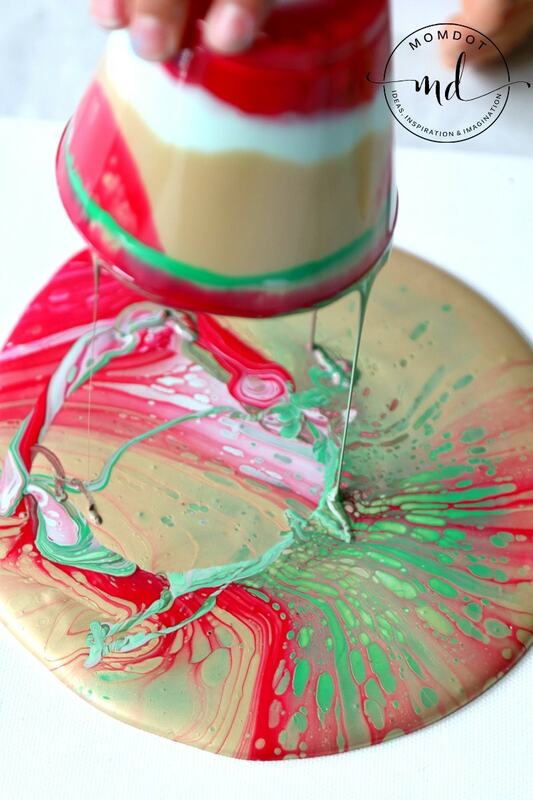 Pour in a generous amount of paint into a clear cup. Now add another 25-30% of Floetrol (the percentage based on how much paint you poured). Add 4-5 drops of your hair oil. Mix all together until paint is smooth. Set aside and do for each color. UPDATE: I have found that a 2:1 ratio works better. Less paint per Floetrol will help with the cracking/crazing of your finished product, as will a warmer temperature while drying. My current recommendation would be 30 grams Floetrol plus 15 grams paint, equalling 45 grams per color. I also recommend three colors, plus a white, all mixed at that 2:1 ratio, for best results. Now taking each color, layer slowly by pouring in a clean clear cup. 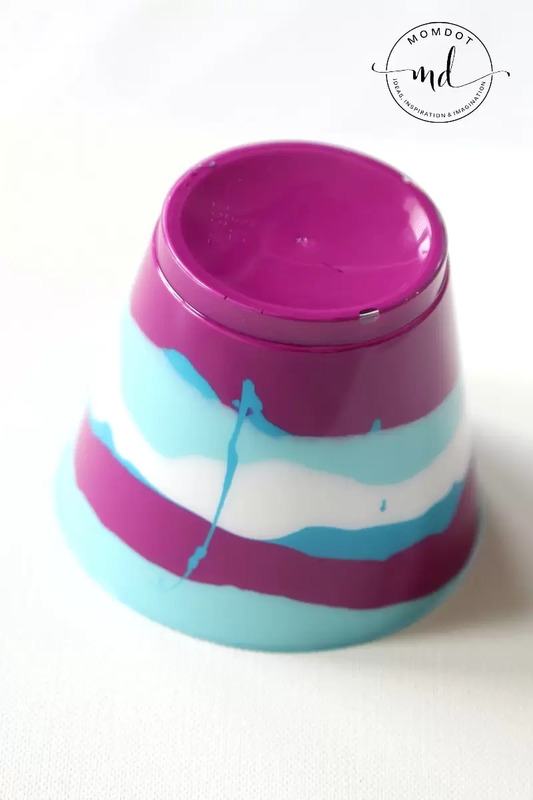 Pour a layer, put down, pour another layer (start in middle) and keep going alternating colors until the cup is full to the top. Parents: I let my son pour but held onto his hand and directed when to stop. Now add your canvas upside down on the cup and turn both so the cup is flush on the canvas. Now you can have your child LIFT the cup and quickly turn it right and set aside on your covered surface. One mistake we made here was I let Phoenyx continue to spread the paint from the cup into the pour and it left some weird markings in the middle. If you want to spread paint do it on the OUTSIDE of the canvas. The hard part is done and now all you have to do is let your paint go from edge to edge. I let Phoenyx tip the painting to each side before I took over and brought it edge to edge. 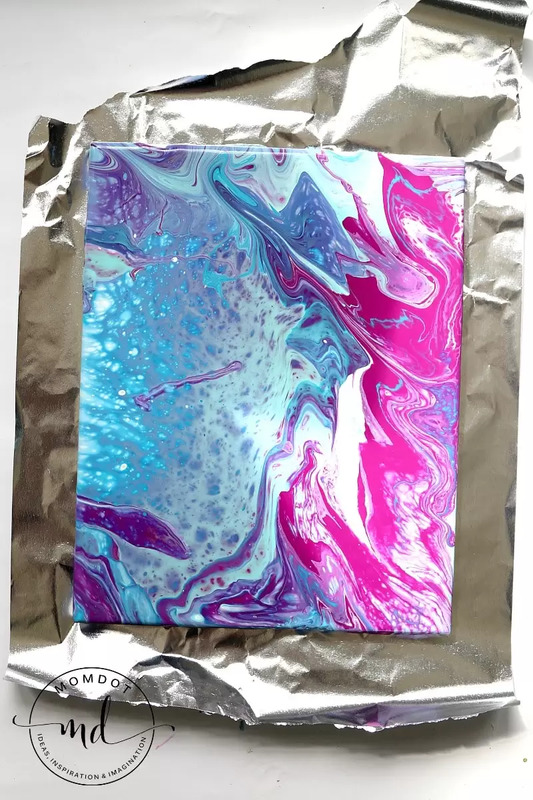 We were super pleased with this pour and really love how it has rivers of color as well as cells. I think I would have loved it more had it not had that one extra streak in the middle, but this was our first one so we are happy! Unfortunately a day after this while it was drying, my cat jumped on it sooooooooooooooooooooo now it has a paw print too. See our other project here. Love this idea! Was thinking of doing this for my daughter’s art b-day party. I’m worried about the drying time. Would a hair dryer on cool be a bad idea to speed up the process? I haven’t personally attempted to dry it with a blowdryer, but I imagine that it could speed the dry time. However, since it’s a party where you’d like the kids to go home with a project that they’re proud of, you may want to try one yourself a few days before. To dry all the way, it has taken our canvas’s about 2-3 days to dry entirely. Are the chemicals safe to use with kids? You would need to read the back of the paints you use to decide. My kids are older and in a well ventilated area and since I do all the mixing and you dont touch the paint, I saw no issues with it. Can you use acrylic craft paint? What is “hair oil”? Can you share a picture or brand. I don’t use this…only shampoo and conditioner so I don’t know.